The blood clam Barbatia virescens is an ecologically and economically important species in the southern coast of China. Understanding of the genetic structure of B. virescens populations is vital to breeding strategies and conservation programs. To develop and characterize a set of microsatellites loci primers for B. virescens, and provide helpful information for reasonable utilization and protection of B. virescens natural resources. The microsatellites of B. virescens were detected using a RAD-seq approach based on an Illumina sequencing platform. For the test of microsatellite development, we calculated the number of alleles (Na), observed heterozygosities (Ho), expected heterozygosities (He) and exact tests for deviations from Hardy–Weinberg equilibrium (HWE). Twelve polymorphic loci were used to access the genetic diversity and population structure of four B. virescens populations. In this study, 50,729 microsatellites of B. virescens were detected. Twenty-two polymorphic microsatellite loci were developed for B. virescens. The number of alleles per locus ranged from 6 to 15, and expected heterozygosities varied from 0. 567 to 0.911. All the PIC values of the 22 loci were greater than 0.5, indicating that these markers were highly informative for further genetic analysis. Twelve loci were selected to analyze genetic diversity and population structure of four B. virescens populations collected from different geographical regions along the southern coast of China. The results showed moderate to high levels of genetic diversity in the four populations (mean Ar = 7.756–8.133; mean Ho = 0.575–0.639; mean He = 0.754–0.775). Pairwise FST estimates indicated that there was significant divergence among the four populations. 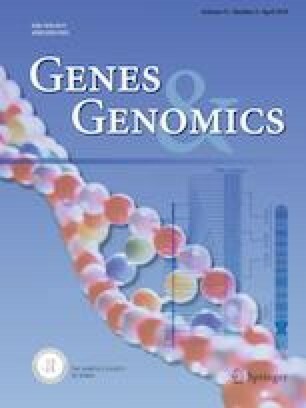 This study not only provides a large scale of sequence information of microsatellites which are valuable for future genetic mapping, trait association and kinship among B. virescens, but also offers useful information for the sustainable management of natural stocks and the development of breeding industry of B. virescens. The online version of this article ( https://doi.org/10.1007/s13258-018-0769-y) contains supplementary material, which is available to authorized users. This study was supported by the grants from Fundamental Research Funds for the Central Universities (201762014), and Industrial Development Project of Qingdao City (17-3-3-64-nsh). This study was funded by Fundamental Research Funds for the Central Universities (201762014), and Industrial Development Project of Qingdao City (17-3-3-64-nsh).